Dr Robert Moog and his associates were responsible for the birth of the modern electronic musical instrument and sound synthesis. Way back in the 1950's they developed a range of voltage controlled, experimental analogue music machines that formed the early versions of the Moog synthesizers we have come to know, love and hold in such high regard. The 'godfather' of additive synthesis and the synthesizer, Bob Moog was a pioneering designer and engineer who's ideas and concepts formed the elements that would eventually take form as the early Moog Modular Systems. These big, cumbersome analogue beasts were the playgrounds for sound scientists in lab coats and it wasn't until Bob decided to plumb a keyboard onto one of his synths did it start to finally take shape of the synthesizers we know today. The first commercially accessible Moog, was the MiniMoog Model D. First issued in 1970, it brought the racks of modular down into a more realistic 3 oscillator form factor and added a keyboard. This made it the first truly 'for anyone' analogue synthesizer and the first to really give the guitarists of the time something to fight against for volume on stage! The Model D was discontinued in 1981, when digital synthesizers were more in demand, but in 2017 the Model D was reissued in all its glory using schematics and components from the original production runs. From the back of the behemoth modular systems, Model D and their lineage of analogue perfection, Moog have released a wide array of synthesizers that retain their signature filter and oscillator quality. Synths like the Sub 37 provide two oscillators and Moogs signature 24dB transistor ladder filter, but in a more more flexible state variable form. To cater to the growing modular scene, Moog have recently reissued a selection of their iconic modular systems and have also introduced the incredibly affordable and eurorack friendly Mother 32. Though the man himself sadly passed away in 2005, Moog continues to honour Bobs legacy by building incredible, forward thinking iconic music machines that always provides that signature gutsy tone they are loved for. Still hand built with love, care and attention in Asheville, North Carolina, Moog is employee owned and run and is one of the few originators of the analogue synthesizer that still exist today. 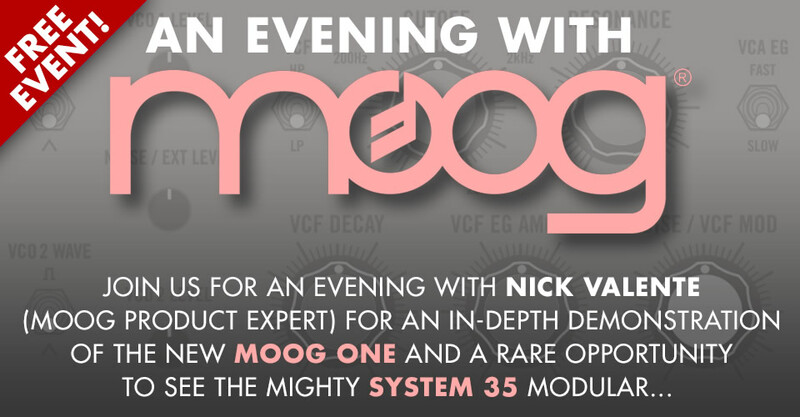 Here at KMR Audio we're big Moog fans and privileged to be the ONLY MOOG PRO dealer in London. Our Synth Expert, Tom Lewis, spent three days at Moog Headquarters in North Carolina undergoing intense training and workshops to allow him to provide the best Moog product knowledge available. We keep many Moog synthesizers on demo, and can provide expert unbiased advice and information on any Moog product, ranging from Synths, Guitar Pedal effects or Modular Systems.